Until their paths cross unexpectedly when, one night, Hannah finds Luke doubled over in his car outside her house. In the aftermath of the accident, all three struggle to understand what happened in their own ways. But when a devastating secret about Hannah and Emory’s argument ultimately comes to light, they must all reexamine the things they hold true. In alternating chapters, a skeptic and a believer piece together the story of their complex relationship and the boy caught somewhere in the middle. New York Times best-selling author Tamara Ireland Stone deftly crafts a moving portrait of faith, love, and friendship. 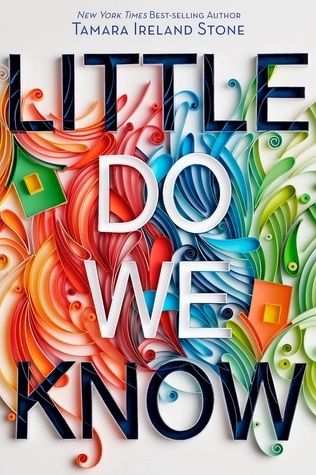 We have an ARC copy of Little Do We Know to give away! I love books told in multiple POV by chapter. this book not only has a beautiful cover, but promises so much emotional turmoil inside. My favorite YA summer read. I love love stories, this will be a good book to read. Big congrats on 3 mil pageviews. That's wonderful! I love stories about friendship. This one sounds great, and the cover is cool. Congrats Val and Jess on 3,000,000 page views. What a big accomplishment for you two. This story sounds intriguing and I can't wait to read it to see what really happened between Emory and Hannah. Congrats on the celebration - I love following this blog! Loved Every Last Word, so I would love a copy of this book!